When you’re looking up text or values you’ll often want to use wildcards in your searches. 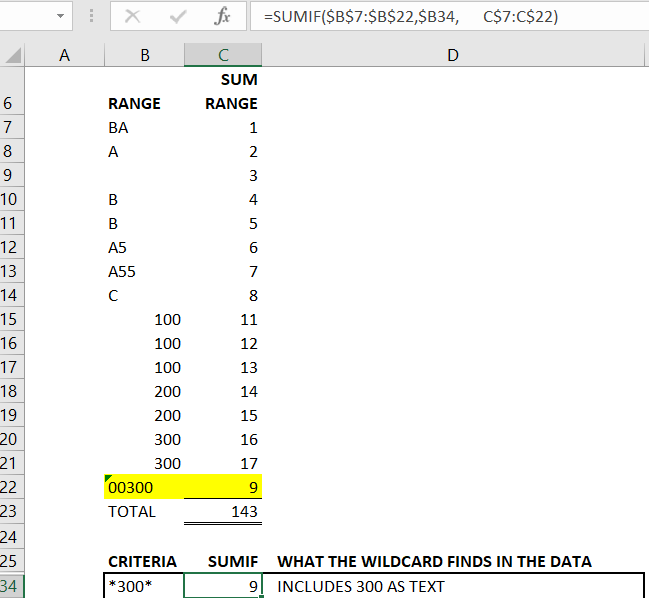 Lets look at the wildcard combinations using the SUMIF function. 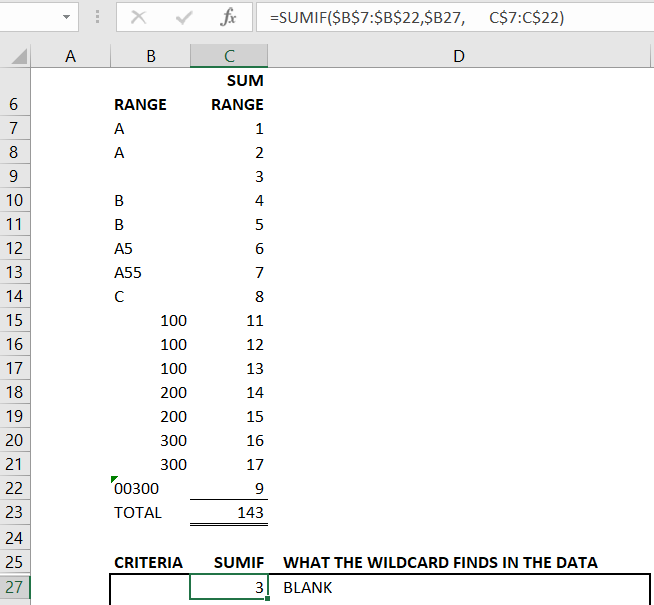 The arguments for SUMIF are: RANGE, CRITERIA and SUM_RANGE. RANGE is where we’re going to look for our criteria. CRITERIA is what we’re looking for (this will include our wildcards). 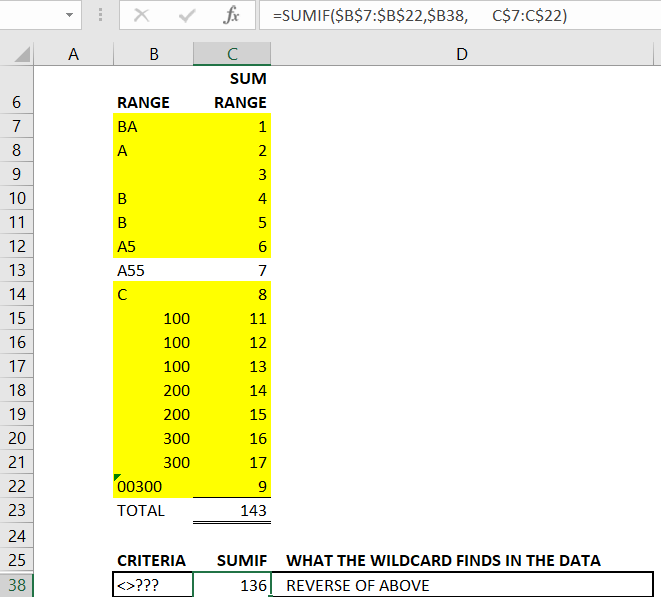 SUM_RANGE is the range of data to sum when the criteria is matched in the range. 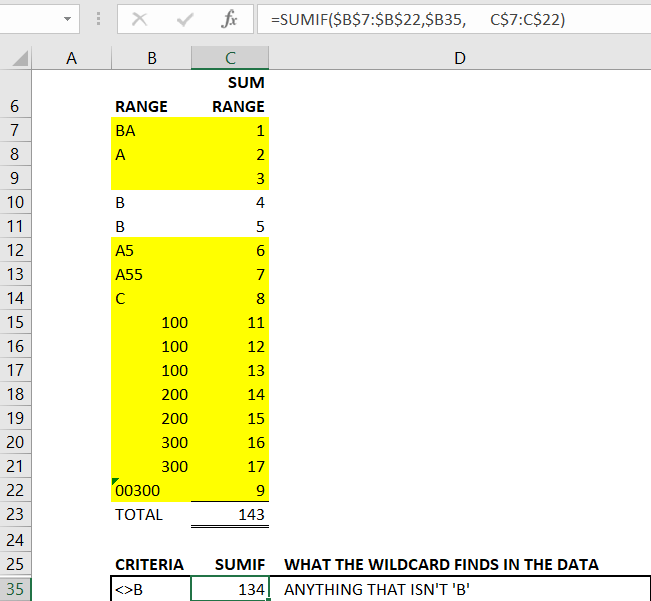 To start, check Fig(a1) for the table we’ll use when analyzing the wildcard results. 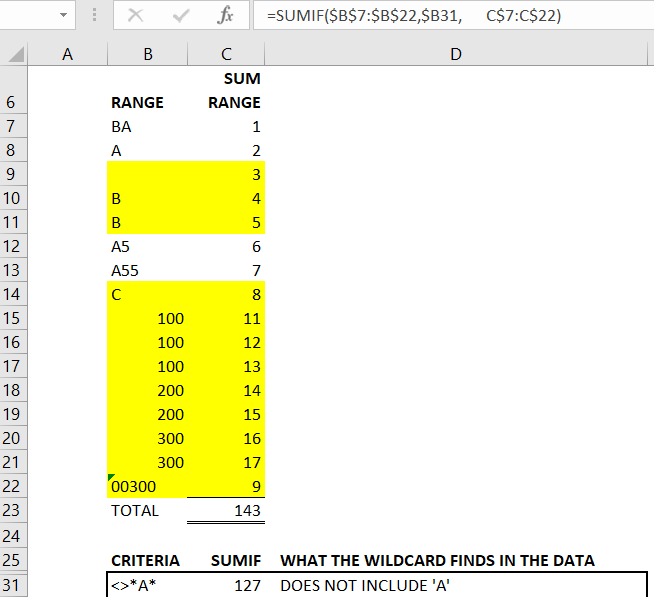 This table shows also shows the results for SUMIF with 300 as the criteria. It is worth noting that the result includes cell B22 even though this is formatted as text. This might be surprising so it is worth being aware of. Other than that, as expected this sums all cells in the range that equal 300. It doesn’t matter if cell B26 is formatted as text or a number, the result of the SUMIF is unaffected. Now lets look at the wildcard examples. 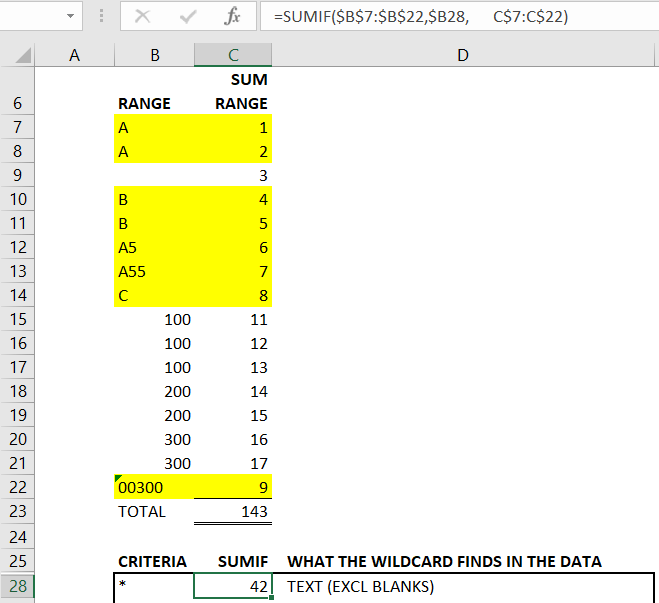 If we use a blank criteria the SUMIF will sum all the blanks (cell B9 in this case). 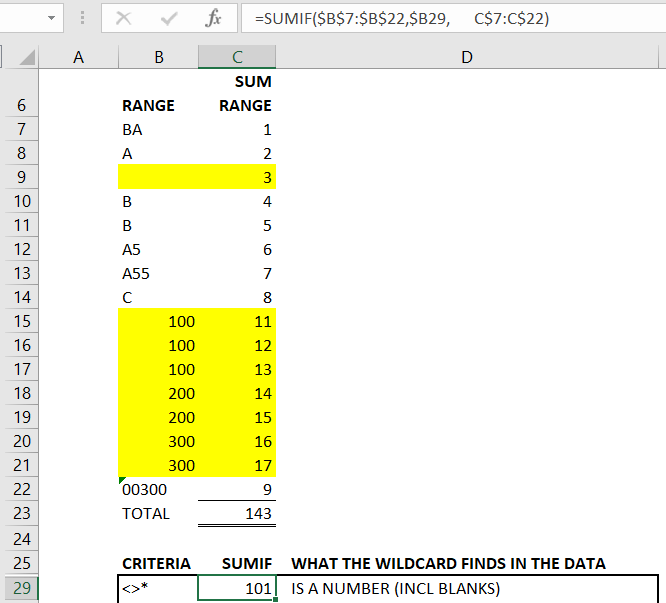 COUNTIF works in the same way with BLANK criteria. This may be useful to identify any blank cells in a list. You may want to consider this as a validation check in your spreadsheets. Either to check users have entered all relevant cells. Or to check that data you’ve imported to Excel is complete. 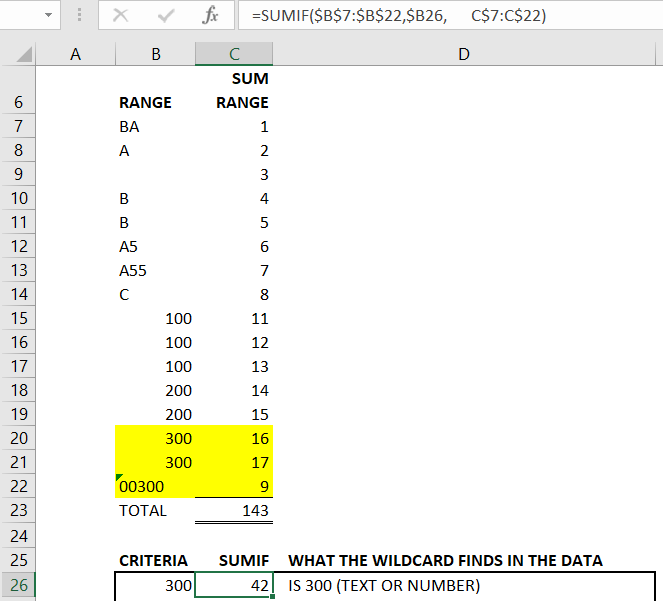 The asterisk is a wildcard for any text in the search for matching cells. When used on its own as in this case it returns any cell with text. On its own it therefore excludes all blank cells (as well as excluding any numeric cells). Again this can be a useful validation. While the example above was checking for blank cells, this time we’re also excluding numeric values from the result. The rows summed are shown in yellow. Now if we add ‘<>’ to the asterisk wildcard we can get the opposite result. So ‘<>*’ will return a sum of all the numeric cells (including any blanks in the range). Lets check our list for ‘*A*’. 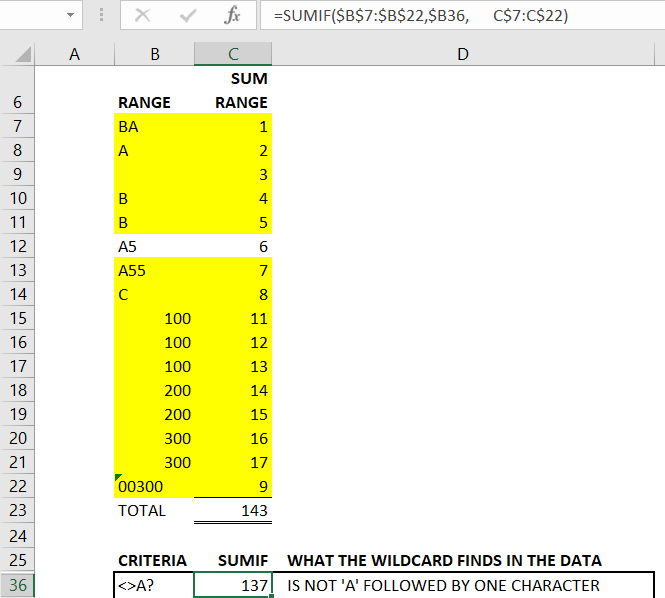 This is one of the most common uses of wildcards in Excel, particularly with VLOOKUP or SUMIF. 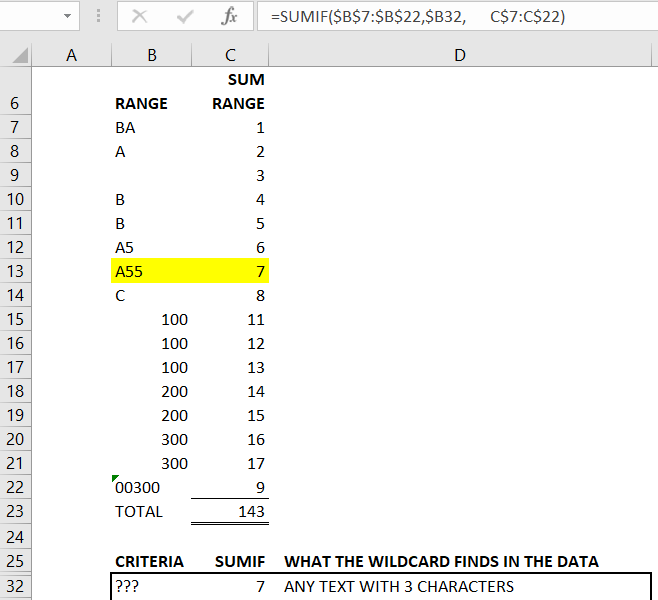 You can see below that anything with ‘A’ is found and the range in column C is summed. This is not case sensitive. Reversing the wildcard in 4. above. We just add ‘<>’ to the previous string. 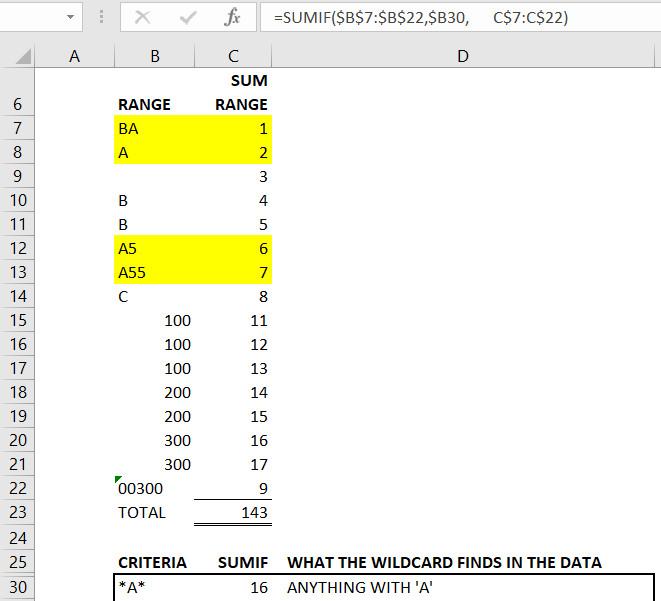 So ‘<>*A*’ is going to result in a sum of all cells that don’t have ‘A’ in their value. 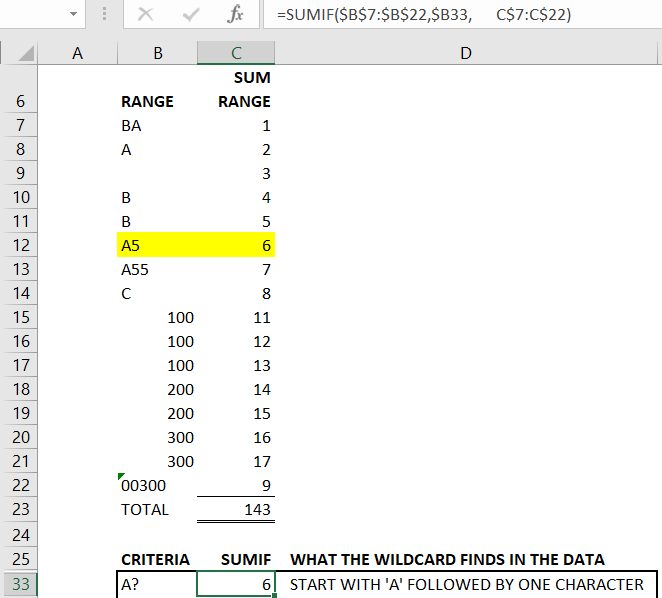 This sum includes the blank cell B9 as this also fulfills the criteria of not containing ‘A’ in its value. Again this is commonly used. While the asterisk ‘*’ represented any number of characters, the question mark ‘?’ is just going to represent a single character. In the example below we’ll use ‘???’. As it only counts text, the 3 digit numbers are not included in the result. That being the case, only cell B13 meets this criteria. In this example we’ve joined the question mark ‘?’ wildcard with text ‘A?’. As it counts as just one character the SUMIF includes only two character values that start with ‘A’. The only cell in our range that meets this criteria is cell B12. If you’ve been following along so far it may not be surprising that ‘*300*’ is just going to pick up text with ‘300’ in the string. Any numbers with 300 are going to be excluded from the result. Lets try excluding all cells in the range that equal ‘B’. Following our logic this is simply ‘<>B’. Again we just need to take our string to identify ‘A’ followed by one character and precede it with ‘<>’. 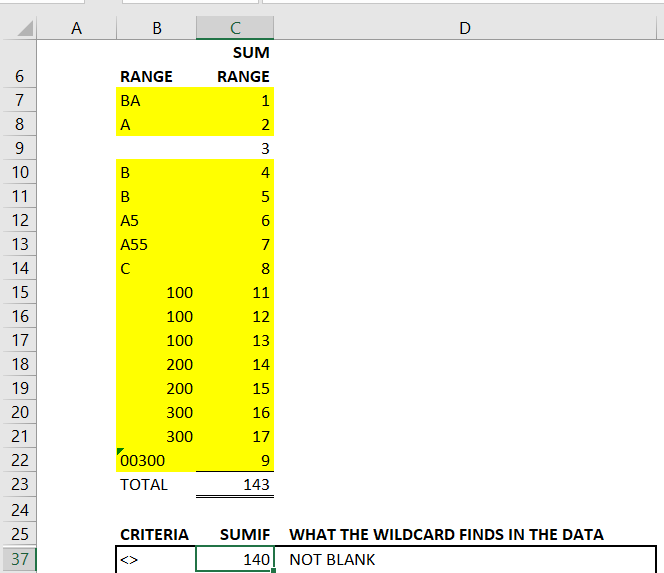 We can find all non-blank cells by using the exclude ‘<>’ wildcard on its own. We’re going to use ‘<>?? ?’ in our last example. The exclusion picks up the text strings that are 3 characters long. However, numeric numbers are ignored so they are not excluded from the answer. 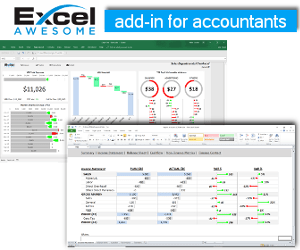 Work smarter in Excel with our free productivity tools. Hopefully these examples are enough to see the options. It is important to consider what is being excluded or included. Particularly with regard to numeric cells and blanks. As well as being powerful SUMIF criteria, these can become an excellent validation check in your spreadsheets by using COUNTIF and COUNTIFS functions. “*300*” similar to 4. above this will match any cell formatted as text that has ‘300’ somewhere in its string.